Low carb vegan baking is a bit of a challenge. Normal vegan baked goods get their texture from starch and sugar, while low carb baked goods often rely heavily on chicken eggs. With these muffins I came pretty close to 'cracking the code', if I do say to myself. 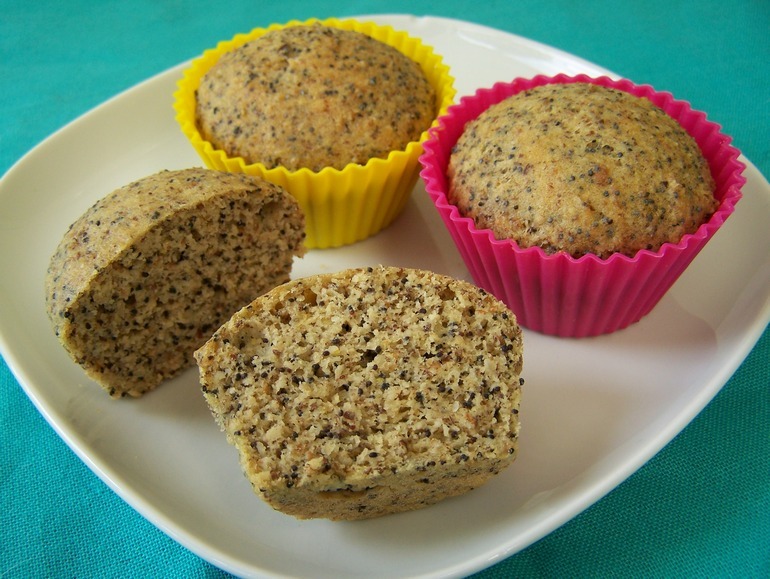 I used a combination of vital wheat gluten, flax and soy flour for texture, and added lots of goodies to get that lovely lemon-poppy seed flavor. Once you have all the ingredients, they come together very quickly too. With all those high protein ingredients, these little cakes are very filling. They are a perfect snack to bring with you to work or when you are going on a trip. Unfortunately, they only keep for about two days at room temperature. They freeze and thaw very well though, so you can easily make a big batch and put them in the freezer for when you fancy something sweet. Preheat the oven to 180 C / 350 F. Mix all the dry ingredients in a big bowl. Add the liquid ingredients and mix with a fork until it forms a smooth batter. The batter starts out a little liquid, but it will soon thicken into a soft sticky dough. Divide the batter over 12 to 15 greased muffin tins. Put in the oven and bake for about 25 minutes. Allow to cool and enjoy! One muffin (of 15) contains about 105 kcal, 8 g fat (1 g saturated), 2 g net carbohydrate, 3 g fiber en 7 g protein. Hi! I love this recipe and would like to try it out! One question, though, can I skip almond flour? Or substitute it with more soy flour? I was also thinking of adding protein powder. Have you tried it? Thank you! Hi Agi, I think you can skip the almond flour and use a bit more soy flour. The soy flour can be replaced with protein powder, that actually works really well. I hope you enjoy this recipe! Hi Nan, thanks for commenting! It's 180 Celcius, which is 350 Fahrenheit. I edited the recipe description. Thanks for all these recipes. As a vegan with gestational diabetes they are really helpful at the moment. My muffins came out awfully dry - any tips on how to get them a bit more moist next time? Hi Jane, nice to hear that you find my website useful! You can add more plant milk to the batter to make the muffins more moist. Loved these...and I modified your recipe for a chocolate version (choco-holic here). I didn't have all of your ingredients, but I was able to substitute a few. For anyone who wants to make the chocolate version, you can find my recipe o my low carb vegan Type 1 Diabetes facebook page (credit given to lowcarb-vegan.net for the original recipe). IMPORTANT - measure your ingredients by weight, not volume as various things have very different weights. I use a small, inexpensive kitchen scale. Thanks for the inspiration. See link below. https://www.facebook.com/groups/942541212505291/! Hi Nan, your chocolate version sounds delish! Happy you are enjoying my recipe and making it your own. Hi Martine, Our family is still enjoying your recipes daily. I think I've made a loaf of bread and your waffles once each week for what seems like almost a year! Any thoughts on a cookie recipe? I've been experimenting now and then with the pancake recipe as well and generally it's been good. I've added the soy protein which actually makes working the dough easier I find. Thanks! That's so awesome to hear Scott! I sometimes make cookies with a mixture of almond flour, bran, ground flax, oil and a little sweetener. You can also add cocoa powder of course. Would you like to post your pancake recipe in the comments?